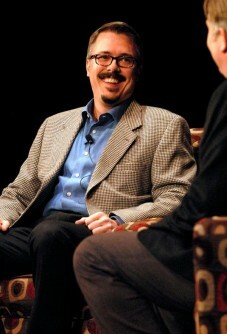 When Vince Gilligan made a National Writers Series appearance in February of 2012 millions of people were addicted to the show he created about a desperate chemistry teacher, an RV, and a town named Albuquerque – Breaking Bad. One of Hollywood’s most successful producers and writers, Gilligan was an incredibly down to earth guy. He traveled to Traverse City with his wife Holly and enjoyed a scotch at Black Star Farms. A year and half later, when author Jamie Ford came to Traverse City to talk about his new book Songs of Willow Frost, the finale of the award-winning and critically acclaimed show was set to air. Ford watched the finale at the State Theater along with hundreds of other Traverse City area fans of the show. Visit the NWS Author Archive and See Who’s Been Here!